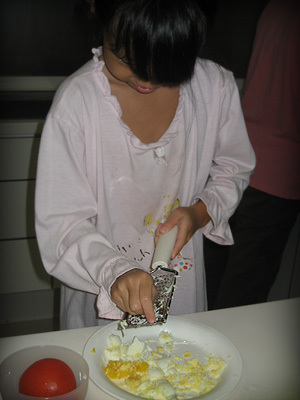 First grate the eggs or mash them up in any way you can think of. 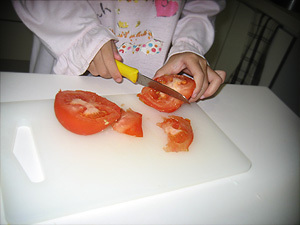 Second, prepare all the other stuff like slicing up the tomatoes. 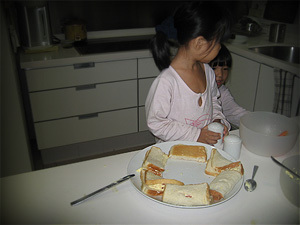 Third, in order for this task not to be boring and lonely, feel free to invite a sibling to participate. Once everything seems fine, add a final dash of pepper and you are good to go. Before serving, cut them up in pieces that can be easily managed. Lastly, lay them out nicely on a platter and say “wahla!” with pride in the final outcome. A few mistakes can also be observed. 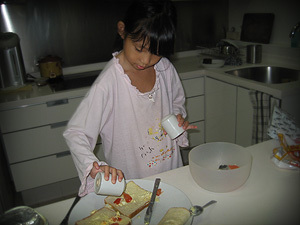 Wearing PJs to make food without a happening apron is totally unglam. This entry was posted on Thursday, July 31st, 2008 at 11:00 pm	and is filed under Blog. You can follow any responses to this entry through the RSS 2.0 feed. You can leave a response, or trackback from your own site. 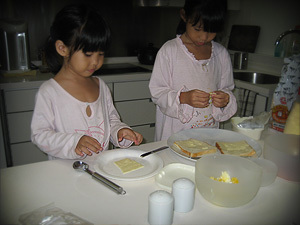 Reading your two little princesses blogs just warms my heart.